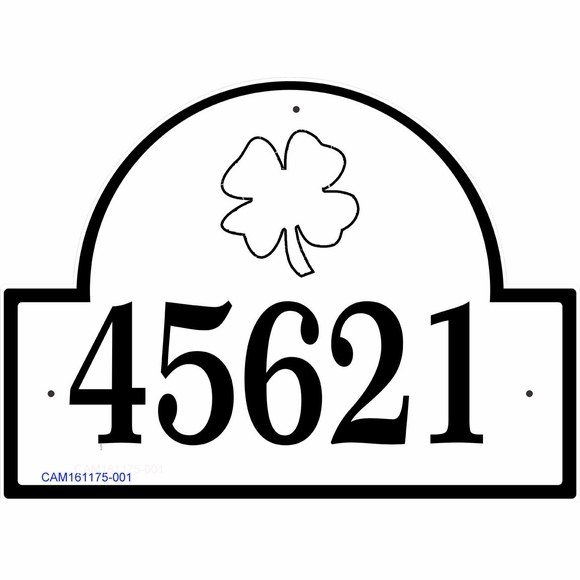 Four Leaf Clover Personalized Address Plaque - - features a four leaf clover, long considered a symbol of good luck, above your house number or name. Wall mount. Made in USA. 16" x 11.75" arch address sign customized with the address number or name you specify and your color selection. Holds up to four (4) 4" or five (5) 3.5" characters. Note: the style number you see on the sample signs is for internal use only and is not part of your custom sign. Border is the same color as the personalization and accentuates the traditional arch shape. Dimensions: 16"W x 11.75"H x 1/8". In the early days of Ireland, the Druids thought four-leaf clovers offered magical protection and warded off bad luck. According to Scribner's Illustrated Magazine for Girls and Boys, Volume 4 (November 1876-November 1877), the first leaf represents faith, the second is for hope, the third is for love, and the fourth is for luck.